I've always taken a relentlessly positive approach to losses: if your job goes away (for whatever reason), find a new one promptly; if a romance goes phfft, go out and get involved in some activity where you'll meet new people; etc. I wouldn't let myself feel any negative emotions about the situation, let alone express them to anyone else ("I'm not a whiner," I told myself). However, after years of doing this, I realized that my life seemed to be getting narrower and duller. This book helped to show me why: having never dealt with the pain associated with previous transitions, I was subconsciously choosing the "safer" alternative rather than taking any risks that might lead to yet another painful loss. I was unemployed for almost 10 months, submerged in a deep state of depression. To get out of it and do something useful with my life I started a Master degree. My first course required writing a personal essay after reading this book. This book allowed me to change my personal perspective. I understood what I was going through. It was my light at the end of the tunnel. It made a difference in my life and gave me hope at a personal but most important at a professional level. A friend pointed me toward this book. In a very short space of time he lost a child, lost his home, lost his job, and watched his remaining children leave for college. How did he survive such major life changes? This book was certainly a part of his survival tool kit. Later, when I was facing a major life change, he directed me to this resource. I found it enlightening and reassuring. This book is a definite 5-stars for anyone going through major life change. How to Identify the Patterns in Life Transition? I bought this book about five years ago and it helped me make sense of a change in my life. The book is exceptionally well written. The author writes simply and clearly. The text uses plain English, is free of jargon and is accessible to anyone who can read. The book explains the importance of endings and why one should not try to rush through them. Bridges explains about moving from the ending to to a place in between ending and beginning that he describes as the "Neutral Zone" a difflicult period that may seem as though it won't end but Bridges encourages readers not to rush through it and assures them that it too shall pass and lead to a new beginning. He explains that the new beginning cannot be rushed but will happen when you are ready. This book was the first book that I read on emotional change and transition (almost 20 years ago). I have recommended this book to hundreds of people because I have experienced the impact that understanding how to cope with change and transition can have on an individual. 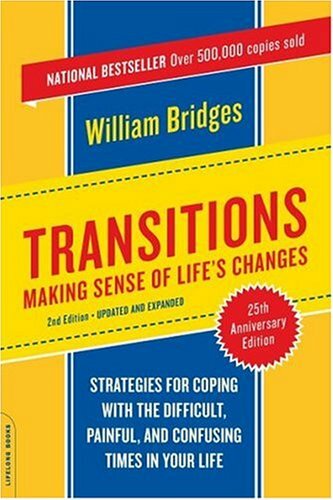 I was fortunate enough to spend a week studying with Mr. Bridges at the CapeCod Institute in 2002 after the launch of his sequel, The Way of Transition. The course was targeted for the helping professions to offer perspective on how people cope with life change and more importantly, how we can support them through it. I was one of the few management consultants in the room amongst pastors, nurses, therapists, teachers, non-profit directors, etc. Needless to say, I was blown away by how limited my view was on the human condition and by how important it is to hold it up, honor it, and respect it both inside and outside of work. *reminding them of their compassion for others as they get out their swords for a proverbial "land grab"
An icon in its field. The book helps understand the difference between change and transition. It has universal apppication: personal, professional or cultural; across any stage in life and any situation. I found the strong process parallels with Khubler-Ross' work ("On Death & Dying") very interesting. In a recent survey, people were asked to list the most disturbing and disruptive things in their lives, and rank them according to difficulty to handle. It was seen that the highest proportion of difficulties involved transitions in people lives -- moving, new jobs, divorce, marriage, new child, death, etc. Surprisingly, there is not a great body of work dealing specifically with transitions and methods for coping and dealing with transitions in life. William Bridges provides a useful, accessible, and needed book on this important topic. The book is divided into two broad topics: The Need for Change and The Transition Process. There is a brief epilogue following. Being in transition is natural, but sometimes a confusing state, not simply because of the situational difficulties, but because they are not supposed to be difficult to handle. Anyone who has returned from a big holiday trip knows the truth of this -- how often does one feel 'I need a vacation to recover from my vacation'? Modern psychologists have identified different stages in life -- different psychologists offer up frameworks that vary in the particulars, but what they all have in common is a recognition of struggles and adjustment periods as one makes transition from the various stages, from childhood to adolescence, to young adulthood, etc. These are transitions that underlie the situational transitions. Like the answer to the riddle of the Sphinx, the answer to dealing with transitions depends upon understanding what underpins the human being. The two greatest areas of transition that are addressed in this text surround those issues involving love and work. Other transitions occur, but few concern us that do not concern one of these issues. All our relationships with others, as well as our internal integrity issues, relate in some way to these two issues. Bridges provides some background, as well as a checklist to follow for understanding the transition. It seems somewhat trite to say, but every ending can be a new beginning. The essence of the transition process lies in this statement. What most people overlook in making this statement is that most transitions are not smooth progressions from point A to B. There is a disruption, a confusion, often a sadness, sometimes an elation, but in every case some period of adjustment to the positive and negative changes that have occurred. Some cultures have specified timeframes for grief and mourning that assist in times of death; the honeymoon is meant to be a transitional period after marriage (a term co-opted by others who wish to have a smoother period of introduction after a change -- as in political honeymoons after a transition of government). It is unfortunate that most neglect to properly grieve for things that are important but are not the 'actual death of a person'. We don't allow ourselves to grieve for the lost job, the lost relationship, the lost community when one moves -- we know and recognise there has been a change, but we are reluctant to call it grief, and thus not always able to deal with the issues properly. This is perhaps the greatest contribution of Bridges -- to put processes together to permit adjustment periods. Only when this is done may the truly new beginning be made. The conclusion of Part 2 deals with new beginnings. The importance of keeping our grounding as human beings is emphasised over and over, so that we don't rush ourselves into a new beginning prematurely -- even if circumstances require the change (your job ended, and a new one starts immediately), you can work through the transition process to internally cope better with the change, giving up the old and embracing the new in a healthy manner. Bridges uses the story of Psyche and Amor, and the trials of Psyche in her task to be reunited with Amor, to illustrate the power of transitions. There will be help along the way, but the greatest task still remains one of personal responsibility. There are no guaranteed happy endings, either. This book is an interesting and helpful guide to understanding the constantly changing milieu in which we live from the standpoint of personally coping with change. As a society, we are undergoing various changes, the dramatic nature and radical impacts of which are unlikely to be fully known for years, if not decades. If ever a book on coping with transitions was needed, it is now. Transitions by William Bridges walks you through transitions. He makes good distinctions in the differences between loss and grieving, simple change, and transitions. This belongs in your owner's manual for living. Change has a goal. Transitions don't. In a transition, you have no idea where your path leads. To sedate myself, I often imagine the transition I am in is a simple change. This looks and feels like the denial process of grief. I say to myself, "We're just moving to a place without stairs." Deep down where I avoid looking, I recognize this simple change is really transition. Our lives will turn upside down and I don't know who I will be or who we will be on the other side. Transition has three stages that overlap, come and go. 1. Endings: It is useful to identify what is ending in your life. For instance, my life as a father with children living at home is ending. 2. Neutral Zone: This can look and feel like depression. Things go flat, rudderless, ambitionless. Time spent alone in silence, in nature works wonders. 3. New Beginnings: You cautiously begin the new ways of living. The desire, of course, is to leap to the new beginnings before paying the dues of steps 1 & 2. I promise you, there is no short cut. You will pay those dues one way or another before you truly can begin. I suggest you pay them cheerfully and proactively by scheduling the time needed. It goes fastest that way. This book was a turning point for me. When I was divorced, I was in a rush to move forward toward -- something. That's how I was raised, to keep on moving even if I didn't really know where I was going! "Transitions" made so much sense. We need time out, an interval, in which to quietly acknowledge what is past, whether it's a marriage, a job, or a home town, a time to simply be. I declared an intown vacation, didn't answer the phone, did no work and, to my amazement, finally met "me." Thank you, William Bridges. I now include personal "intervals" as integral parts of ALL major life transitions! Highly recommended for anyone undergoing changes. This book has changed me both personally and professionally. Last summer I was stewing over a couple major life decisions each of which would have dramatic and irreversible consequences. A trusted friend highly recommended this book so I gave it a look, even though I'm not a self-help book fan and am extremely skeptical of counselors in general. I was pleasantly surprised. The author very accurately described what I was feeling at the time, then went on to offer sensible explanations and advice, some from perspectives I don't think I would have reached on my own. Worth reading if you have a traumatic change. The book "Transitions" by William Bridges (appropriately named :-) tells us that, following a traumatic change in our lives, we can look forward to three stages: The first is the chaotic roller-coaster of denial, indecision, etc. The final, or third stage, is renewal -- the start-over stage. The second stage is how to get from stage one to stage three.